Liman adds to his knack for controlling audience tension a moody visual sense that exploits the mournful, sleeping-giant, old-world architecture of Prague as a place where action may break out at any moment, and frequently does. 119 min. Universal. Director: Doug Liman. Cast: Matt Damon, Franka Potente, Chris Cooper, Clive Owen, Brian Cox. In a summer that's shaping up to be pretty good for pulp entertainment, the long-aborning The Bourne Identity provides more essentially guilt-free thrills. Director Doug Liman adds to his knack for controlling audience tension a moody visual sense that exploits the mournful, sleeping-giant, old-world architecture of Prague as a place where action may break out at any moment, and frequently does. In making Robert Ludlum's twenty-two-year-old spy novel vital for a post-milennial audience, Liman and screenwriters Tony Gilroy and William Blake Herron jettison much of Ludlum's construct (including his incorporation of real-life assassin Carlos into his fictional plot). Matt Damon plays Jason Bourne, who—after being dragged from the Mediterranean Sea—discovers that he suffers from amnesia and may well be some type of hired killer. Indeed, Bourne is unintentionally AWOL from his C.I.A. bosses, who want the red-handed Bourne to come in from the cold or--perhaps more expediently--die. Catching on quickly that he's a target, a desperate Bourne recruits an innocent young traveler named Marie (Franka Potente of Run Lola Run fame) to transport him out of harm's way, give or take a car chase or sniper or two. The actors make a strong case for a now tired story (Renny Harlin gave us the female version six years ago with his comically overwrought The Long Kiss Goodnight). Damon is a strong enough actor to pull off the role of Bourne. With the help of lightning-quick editing, Damon lashes out with brutal instinct, then shows us the wheels turning again behind a mask of focus. It's a neat trick, but more chinks in Bourne's emotional armor would heighten the credibility and excitement. One of the filmmakers' best moves was to bulk up Marie's role, though Potente does most of the work herself in a superbly convincing performance. Taking the hoary convention of the woman swept up into over-her-head intrigue, Potente churns up a wellspring of conflicting emotion that even renders what would seem on the page to be an unearned romance as wholly believable. She's vulnerable, but also capable of steely self-possession. Meanwhile, Chris Cooper and Brian Cox provide their growly (and great) services as nervy C.I.A. wranglers. With nothing enlightening to add to the genre, The Bourne Identity risks irrelevance, but overcomes this deficit with simple and efficient craftsmanship: elegant cinematography by Oliver Wood, effectively spare scoring by John Powell, and taut action scenes put together by Liman and editor Saar Klein. It's enough to make you forget your troubles...for a while. The Bourne Identity races onto Blu-ray as a part of Universal's The Bourne Trilogy box set. Fans will be nothing but pleased by these definitive special editions. The film transfer is top-notch—I can't imagine the picture quality could be any better: colors are spot on and detail is quite good. The overall impression is a smooth, vibrant but naturally film-like look, marred only by an occasional hint of dust or dirt or a touch of noise in a troublesome visual moment. Given the film's intentionally rough appearance, this transfer does the film justice and is the definitive version on the market. The DTS-HD Master Audio 5.1 surround mix is simply awesome, with spectacular directionality and powerfully detailed effects. Blu-ray exclusives will be familiar to loyal Universal customers, beginning with three core U-Control features: a Picture in Picture option that includes cast and crew interviews, set footage, and pre-production art (like storyboards); the Treadstone Files, which give access to high-tech superspy information technology (like pop-up Agent Status, Character Dossiers, Field Reports with "GPS-enhanced satellite views of the locations," and other "top secret training material"); and Bourne Orientation, which jumps out of the film to provide literal orientation (globally speaking) and figurative orientation: more information about what's driving Bourne at key junctures in the story (answering that eternal actor's question: "What's my motivation?"). A feature commentary with director Doug Liman finds the director in a sanguine mood: no talk of his struggles within the franchise, but a detailed accounting of everything else. It's one of those "film school in a box" kind of commentaries that true film buffs long to hear, with Liman addressing his approach to the adaptation, the characters, themes, and all manner of production details, inlcuding locations and special effects. 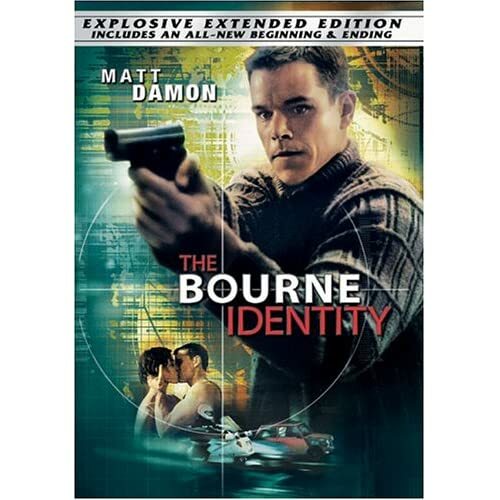 "The Ludlum Identity" (12:49, SD) profiles the creator of Jason Bourne, with Ludlum (archival), Ludlum friend/actor James Karen, Ludlum's agent Henry Morrison, Ludlum Entertainment CEO Jeffrey Weiner, author Eric van Lustbader, and editor Martin Greenberg. This first featurette focuses on Ludlum's life and work, and includes excerpts of two archival interviews with Ludlum, one on Today with Bryant Gumbel. "The Ludlum Supremacy" (12:41, SD) continues pretty much where the previous one left off, and it's annoying that the pieces aren't seamless. Anyway, the discussion continues, with a focus on Ludlum's extraordinary success, and adding the comments of producer Frank Marshall. "The Ludlum Ultimatum" (23:57, SD) completes the Ludlum featurette trilogy by focusing on how Ludlum was approached for the new series, his contributions, and the efforts that went into doing a faithful adaptation. Joining the conversation are producer Paul L. Sandburg, director-producer Doug Liman, producer Patrick Crowley, Matt Damon, and director Paul Greengrass. "Alternate Opening" (2:16, SD) and "Alternate Ending" (4:56, SD) come with an "Introduction with Producer Frank Marshall, Co-Writer Tony Gilroy and Actor Brian Cox" (3:33, SD) and a "Play All" option. As the filmmakers explain, the alternate footage was inspired by post-9/11 skittishness. Four "Deleted Scenes" (6:58 with "Play All" option, SD), including one with Bourne pleading for Marie to stick with him, fill out the story a bit. We also get the "Extended Farmhouse Scene" (:58). The standard-issue featurette "The Birth of The Bourne Identity" (14:32, SD) has Limon, Crowley, Marshall, Damon, Franka Potente, Clive Owen narrate the plot and deliver choice soundbites about the film's development and making, with some behind-the-scenes set footage and lots of film clips. The puzzling inclusion "The Bourne Mastermind: Robert Ludlum" (5:44, SD)--with Karen, Greenberg, and Ludlum (in archival interviews)--is nothing but a conflated version of the earlier featurettes on Ludlum. "Access Granted: An Interview with Co-Writer Tony Gilroy" (4:03, SD) is plenty interesting, though all too brief. "From Identity to Supremacy: Jason and Marie" (3:37, SD) finds Damon and Potente giving a quick summation of their takes on two "ordinary people in extraordinary circumstances." "The Bourne Diagnosis" (3:26, SD) concerns what ails Bourne; psychiatrist Dr. Reef Karim gives a crash course in dissociative amnesia—very interesting. "Cloak and Dagger: Covert Ops" (5:31, SD) allows CIA officer Chase Brandon to explain what the CIA and field ops are all about, pointing out the realism of the film's approach. "Inside a Fight Sequence" (4:43, SD) intersperses on-set rehearsal (including negotiations about the fight moves and camera placement) with an interview with Damon. Lastly, we get the "Moby 'Extreme Ways' Music Video" (3:39, SD). 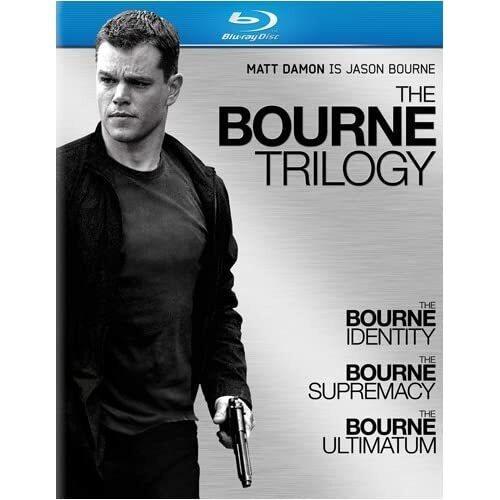 The three discs of The Bourne Trilogy come packaged in a handsome, sturdy box with a magnetized flap (the flap depicts Damon as Bourne). Certainly, the first disc in The Bourne Trilogy Blu-ray set definitely holds up its end of the bargain. All site content © 2000-2019 Peter Canavese. Page generated at 04/20/2019 12:08:55AM.